UPDATE: (12/05/08): A participant at an online comics forum wrote last night: “True. The strip did run in many papers, although some editors pulled it. Others ran apologies the next day. Ummm...for once I don't know what to say. Oh, Dennis, you're about to have an entirely different kind of race problem. Did somebody say CAPTION CONTEST?? "Yo, Dad. Anything else you wanna tell me about your year in Kenya with the Peace Corps?" I've been pondering this one. The tagline itself is kind of funny, and out of the mouths of one of our "edgy young comics," I don't think anyone would take offense. What makes it so weird is that no one would associate "edginess" with Dennis the Menace. 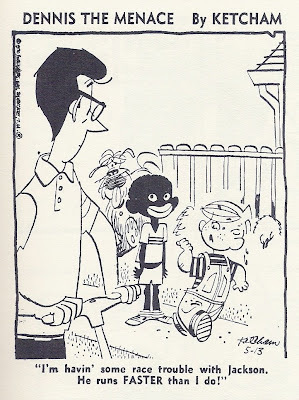 Also, the way the black kid is drawn, apart from the offensive "minstrel" quality, of course, is totally out of sync with the rest of the strip. It's like he dropped in from another strip entirely. Hmmm, do you think Hank Ketcham was experimenting with LSD when he drew this? ^ I think Ketcham was trying to be relevant to changing times ("race trouble") but he totally lacked the visual vocabulary and the modern sense of humor to speak on it. He didn't mean no harm. He did harm, but I don't think he meant to. "...doth protest too much, methinks." "Margaret's got a new pimp." "Martha, come see this. That damn Dennis is playing with that very nice young Afrikan-American. I think his name is Anjawon..."
"Dennis' world is white. The cartoonist says that exclusion stems from an incident several years ago when he introduced an African-American child as a new character. newspapers that carried the cartoon. 'I was just shocked,' Ketcham recalls. "'All of a sudden I was surrounded by a bunch of art directors. "'The content was certainly innocuous but the way I drew him ired part of the community. suggest now and again certain ethnic diversities but I have not made a star out of them.'" ^ Oh my Lord... "shocked," was he? UnderCover: You pretty much nailed it. As Richard's quote partly demonstrates, Ketcham'd intent had been to keep up with changing times by gettin' a little inegration on. His intentions were good, but how he failed to realize that the WAY he drew that kid would make people furious is beyond me. I mean, talk about tone-deaf. I do think it was an odd reaction on his part to swear off depicting blacks at all, rather than retool his design approach. OMG! What about the diagonal stripes of the peanuts! He didn't this this was offensive? Well he gets an OMG for that too! Speechless? I almost bit the tip of my tongue off at this. I have no doubt Ketchum was stunned at the response. His refusal to grow as an artist is more appauling though. He knew which side of his readers was buttered. It wasn't the toasted side. Dennis is likely not to be popular in the OBAMA White House, I might hopefully imagine. Ketchum knew he was dead WRONG for submitting that cartoon for publication. He was SHOCKED that black foke had a voice? What was he SHOCKED about. The reference to RACE he runs faster! Oh yeah, I forgot all black people can run FAST! I'm going to stop commenting.